Features: 6.41" Super AMOLED display, Snapdragon 660 chipset, Dual: 12 MP + 5 MP primary camera, 25 MP front camera, 3400 mAh battery, 128 GB storage, 6 GB RAM, Corning Gorilla Glass 3. There's only been a short interval between launches of Vivo V9 and Vivo V11 Pro and it's no surprise that new model looks pretty much identical to its predecessor. Buttons, SIM tray, ports, and even rear camera module have virtually identical placements. Over the past couple of years, design trends have changed from unibody metals to glass on front and back and Vivo V11 Pro is no different. Although its back looks like it's made of glass, it's actually plastic with a glossy finish. Vivo V11 Pro is also very light, thanks to its all-plastic body and is easy to manage with one hand. It's as thick as Vivo V9, at 7.9mm, but is slightly taller, so it might feel more-bulky in your pocket. This makes it slippery and attracts a lot of smudges, but you can always put bundled soft case to ensure proper grip. On front of the device, there's a large edge to edge display, with a water drop notch and smallest bezels you'll get to see on any phone. Screen covers entire front of device, which makes it look quite unique and futuristic. Inside water drop notch lives a front facing camera, with an earpiece on top of it. Back of device is made of plastic and first thing you'll notice is a dual camera module on top left of device, similar to the one on Apple iPhone X. It protrudes and has a chrome rim around it, with an LED flash right below. There's Vivo branding in middle and "designed by Vivo" branded at bottom in a tiny font, while rest of back is kept clean. Phone's Starry night color shifts from a blueish purple at bottom to an inky blue-black at top. There's a little bit of sparkle to color at bottom, shifting between blue when viewed front-on to purple at an angle. It's a relatively superficial accent, but it definitely adds a little character. Other color option is called nebula which shifts from purple at bottom to blue at top. On right side of phone is a power button with volume keys, while left side is kept clean. At bottom, you'll find a 3.5 mm headphone jack, single speaker and a Micro USB charging port. Top of device is also left clean, giving this phone quite simple yet elegant aesthetics. Overall, it's not a new design, a mere iteration indeed, but new gradient colors and water drop notch really adds a flare into device, making it a head-turner for sure. Vivo V11 Pro's main attraction is its water drop notched display. It has a 6.41 inch Super AMOLED Full HD+ display with a resolution of 1080x2340p and pixel density of 402 ppi (as compared to 6.3 inch display with 400 ppi on Vivo V11). Images and text look sharp, and Super AMOLED panel ensures vivid colors together with deep blacks. Colors are rich, contrast is great, blacks are suitably deep, and Vivo V11 Pro gets plenty bright enough outdoors. There is an always-on display option in lock screen settings, and you should definitely take advantage of it now that Vivo V11 Pro uses OLED display technology. Small notch at very top of screen is discrete and far less invasive than other notches, and best way to implement a notch in my opinion. Unfortunately, if you still don't like it, you can't disguise it in settings, so you'll have to get used to it. 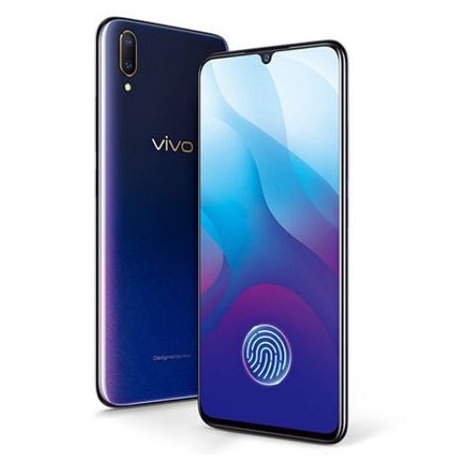 A big reason why Vivo V11 Pro used an AMOLED display is that it's the one right now supporting in-screen fingerprint scanner. It's easy in case of capacitive scanners, but to make it easier with in-display scanning, fingerprint logo lights up on the screen, and you'll have to place your finger there, but authentication isn't very quick. It takes a full second or two before phone unlocks. In contrast, face recognition was lightning quick, and worked well for us even under low light. It doesn't work if your eyes are closed, which makes it a little more secure. For added safety, you can opt for a combination of face and fingerprint authentication. First two-three days, there is a learning curve, you need to get used to placing your finger at right place, and sensor also learns from your patterns. It takes about a couple of seconds to scan, authenticate and unlock device. Considering we are still in early stages of in-display scanners, I won't complain much about it. Also, in this price range, Vivo is the only one offering this tech, so it will take a bit of time until this tech is perfected. In the end, I would say that I am very much delighted to see an AMOLED panel and a futuristic in-screen fingerprint scanner. That's one area where Vivo V11 Pro aces past Oppo F9. Being a midrange phone, one could expect Vivo's latest entrant to have some midrange specs, nothing like Xiaomi Pocophone F1 and that's exactly what you'll see. Vivo V11 Pro is powered by Qualcomm Snapdragon 660 processor and Adreno 560 GPU and has 6GB of RAM as compared to Vivo V11's 4 GB of RAM. Phone has 64GB of storage, which is expandable by up to 256GB via microSD expansion. Most of this phone's benchmark numbers were a bit lower compared to Vivo X21. With Snapdragon 660 and 6GB of RAM, response rates were what you'd expect and on a par with other devices with similar specs. Plastic isn't as good a transmitter of heat as glass or metal, but I didn't notice Vivo V11 Pro heating up, even during benchmarking or gaming. Phone scored 127405 on AnTuTu and 1450 on single core Geekbench. These scores are quite decent, and nothing I wouldn't have expected from a midrange chipset. Luckily, there's still a 3.5mm headphone jack here, but for a phone as futuristic-looking as Vivo V11 Pro, inclusion of micro-USB for charging doesn't make sense. One can only assume it was a cost-cutting decision, but on a near bezel-less phone with an under-glass fingerprint scanner, it's a retrograde choice. Another cost-cutting omission worth mentioning is lack of an IP dust and water resistance rating. There's no NFC here either, though Vivo V11 Pro supports USB OTG and USB 2.0 connection speeds. Bluetooth 5 is supported, and you can switch out your preferred audio codec to SBC, AAC, aptX, aptX HD, or LDAC if you're using Bluetooth headphones. You also get dual-band Wi-Fi 802.11ac, GPS, and FM radio, but no NFC. Sensors include an ambient light sensor, virtual gyroscope, proximity sensor, and a compass. Talking about audio department, there's a single bottom-firing speaker next to micro-USB port and it's the only speaker used for music or media playback. It's loud and actually sounds pretty good, with crisp, clear highs and decent mids, though bass isn't as strong as I would've like. Things get a little weird with wide sliver of an earpiece speaker above notch though. It's so small you probably wouldn't even notice it until you answered a call. But it's so loud it sounds like you've got speakerphone on, broadcasting your call to everyone around you. Only way to address this is to lower volume to the point where you really have to line things up right to hear properly. I'm guessing Vivo didn't use the Screen SoundCasting technology from Vivo Nex S for cost reasons but given Vivo V11 Pro's very loud earpiece speaker, it seems strange not to use it as one half of a stereo audio pair for music. 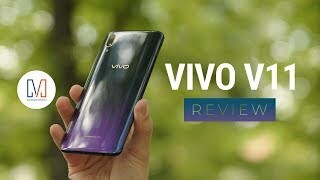 To sum it up, Vivo V11 Pro can get very confusing when you talk about its hardware, however, it offers a much better hardware experience than on some previous midrange Vivo devices. Vivo fans will definitely applaud these enhancements on Vivo V11 Pro. Talking about battery life, Vivo V11 Pro comes no less than what you'd want from a phone in 2018. It has a 3400 mAh battery and with average use, it lasted me for a little over a day, and with heavy usage, I could still sail through day. Heavy camera use does drain battery quickly but otherwise, with regular usage, we easily managed to get through an entire day or a bit more. A single round of PUBG, which typically lasts about 30 minutes, knocked 11 percent off battery meter. Phone supports Vivo's dual engine fast charging tech, which offers 40 percent charge in 30 minutes, about 80 percent in close to an hour, and full charge in less than an hour and a half, thanks to 18W charger bundled in box. My only problem here is the lack of USB Type-C port. Vivo's FunTouch OS doesn't list screen-on time so I can't give you usual battery usage stats. I can tell you 3,400mAh battery on Vivo V11 Pro lasts at least a day and more like a day and a half. Even during heavy usage when I was on my phone far more frequently than usual, it never looked even close to running out of juice. It's a pretty good battery experience on a Vivo device, something I am really impressed about. Here comes the part where Vivo V11 Pro really needs to perform against its competitor, Oppo F9. Phone comes with a dual camera setup, with a 12MP main camera having an f/1.8 aperture with 1.28-micron pixels backed up by a 5MP camera with an F/2.4 which acts as a depth sensor. Vivo V11 on the other hand comes with a dual camera setup of 16 MP main camera and 5 MP depth sensor. Vivo V11 Pro's camera performs well enough with basics like daytime, low light, and high-contrast shots, but only in very specific conditions. Host of AI additions here are fairly unnecessary, often serving only to butcher an otherwise decent image. If you want a basic smartphone camera for pretty good shots in most conditions, Vivo V11 Pro is fine. If you want all the extra bells and whistles or need a versatile camera for a variety of tricky shots, this is sadly not the phone for you. To make things better, however, in main camera settings, you can switch to 24MP, making me think Vivo is using interpolation to bump resolution without adding any extra detail. On a positive side, I was really impressed by HDR mode on Vivo V11 Pro. It didn't overdo results, nicely balancing areas of deep shadow and brightness without giving it telltale HDR look. In fact, camera's HDR was its biggest standout for me. Daytime shots are generally pretty good, but you'll need to stick with primary camera. Phone has a 25MP front-facing camera and it just adds too much noise, to make resulting photos worthwhile. I very quickly gave up on it for selfies because shots it took were grainy and lacked sharpness. On video front, you can only shoot 1080p at 30 fps which is quite disappointing, and with no stabilization available, resulting footage comes out quite shaky. Low light and night-time photography was a mixed bag. Given a static subject and sufficiently steady hands, Vivo V11 Pro can capture some good-looking images. Add a person or moving subject to scene and image is noticeably worse. Vivo V11 Pro doesn't crush blacks as much as phones like Huawei P20, so expect a lot of noise in the dark. Blown-out highlights in things like street lights were a problem at night too, which is a shame considering how well phone handles dynamic range in daytime. Panorama stitching is very spotty, with blurry stitching points and general fuzziness across image. Same goes for basically all of "AI" camera features. Lighting effects are pretty cheesy and not terribly well done. Monochrome background effect worked well, but color added to faces in foreground throws things off. Overall, with a heavy heart I have to admit that Vivo V11 Pro doesn't match up camera performance of phones like Huawei Honor Play or Oppo F9, which are prices in same range as Vivo V11 Pro. It still is a good camera, however, for most casual phones users won't mind drawbacks with Vivo V11 Pro's cameras. Unlike Vivo Nex S, Vivo V11 Pro ships with a global version of software. Vivo's FunTouch OS 4.5 sits on top of Android 8.1 Oreo and delivers a lot of additional functionality. It's still a blatant iOS rip off, but if you don't mind that it's manageable. Unfortunately, there's still no option to enable app drawer. Vivo V11 Pro supports iOS-like gesture navigation which is a little different from what was introduced in Android Pie beta, but it's pretty easy to adapt. A swipe up from bottom left takes you back a step. Swiping up from center takes you home and swiping up and holding brings up app overview screen. A swipe up from right opens control center and swiping down from top of screen drags down notifications shade. It'll be interesting to see if any of this changes with update to Android 9 Pie. Google Play is installed out of the box along with a bunch of standard Google apps, and Gmail notifications came through just fine. There is a couple dozen pre-installed Vivo apps to contend with, but some of them can be uninstalled. Unfortunately, if you switch to gesture navigations, you'll no longer have a convenient way to summon Google Assistant, which is otherwise accessed by long pressing the on-screen home button. You also can't switch between apps as quickly as with virtual buttons, so additional screen real estate gesture navigation enables comes at the cost of some lost functionality. In China, Vivo V11 Pro comes with Jovi AI voice assistant while in India, you get three features, smart camera with face beauty mode which will analyze your skin type, tone and gender, and apply effects. It also detects the scene when you are clicking photo and adds effects to make your photos look better. There is smart scene mode, a Google Assistant card like interface that can be accessed by swiping left to right from home screen. It will show calendar events, weather updates, steps you walked (using gyroscope) and shortcuts for most used apps. It's a handy tool to have, and I don't have any complaints. Funtouch OS also comes with "Motorbike Mode" which when activated will put phone in do not disturb mode. By default, it will reject all incoming calls while you are driving and can also send auto respond messages to callers that you are driving and will respond as soon as possible. Lastly, music app is also integrated with audio effects, which Vivo call DeepField. Basically, its equalizer presets with effects like 360 degrees panoramic surround, mega bass, clear voice, concert hall, and more. It's not great, but it does add a little fun to your music listening experience, only if you want to. Rest of software experience on Vivo V11 Pro is pretty much what you'd expect from a Vivo device carrying ColorOS. Vivo fans will be delighted while stock Android users might have to pass on this one. 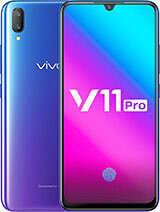 Vivo V11 Pro is available in market now for around $350. It comes in three different colors: Starry Night, Dazzling Gold and Nebula. It is a solid all-rounder at this price and offers better value than Oppo F9, but for a bit more money. Think of it as a Vivo X21 with a bigger battery and better front camera, but at a much more reasonable price, which is a good recipe. However, it's hard to ignore Xiaomi Pocophone F1 at this price level but getting your hands on one is likely to be difficult for a while, whereas Vivo V1 should have better online and offline availability. Then there's Nokia 7 Plus, a phone that has very similar specifications as Vivo V11 Pro, but with allure of stock Android One and much better construction quality. Battery life and fast charging tech on this phone is also worth mentioning here. Only issue I would want to highlight is that software could have been tuned better. In-display scanner isn't the fastest, but it in its early stages, so it will take time to get perfected. 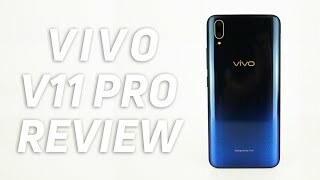 There are some aspects of the Vivo V11 Pro that I wish were different. A USB Type-C port would have been preferable, in-display fingerprint sensor still feels a bit sluggish, electronic stabilization is missing, and custom OS could use more polish. In the end, it's still a strong device to consider, with its water drop notch and futuristic fingerprint scanner.